Of late the online F1 fraternity have been up in arms over the removal by FOM of F1 videos on YouTube. The incredible shortsightedness of the marketing arm of the sport is staggering, especially in view of the fact that FOM offers no alternative to the clips removed. They were the best possible advertisement for F1 and now they are gone. What it does mean, however, is that the only F1 videos that remain are old ones that document a proud and sometimes tragic history. 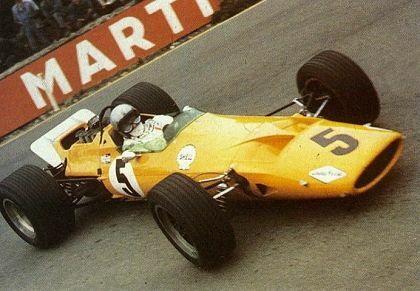 As the world championship goes into its deciding stages with the Italian GP this weekend, it is entirely fitting that we should remember the founder of one the two constructors fighting it out this year - Bruce McLaren. When I first started watching F1 in 1962, Bruce was a young Kiwi about to create a legend. At the age of 22 he was the youngest driver to win a GP, the USGP in 1959 driving for Cooper alongside his mentor, Jack Brabham. In 1963 he followed Jack again in starting to build his own cars and the McLaren story began. Two years later he left Cooper and drove his company's F1 cars. The rest is too well known for me to rewrite here, the occasional GP victory, the string of CanAm successes, and his tragic death in 1970 in one of those CanAm cars that had been the first sign of how great the company was to become. I found two videos on YouTube that give tribute to the man and they are well worth watching. The first, Bruce McLaren Tribute Pt 1, is an excellent overview of his career (the second part details the history of Team McLaren). And the second, Bruce McLaren - the genious of the beginning, is just as good, although we will have to forgive the interesting spelling of the word "genius".